A mammoth gathering of farmers was witnessed at the kisan mela organized by Punjab Agricultural University(PAU) at Nag Kalan Jahangir regional research station.The theme of the mela was ‘Save mother earth; stop stubble burning’. The subject experts of PAU talked at length about recent farm practices and technologies and suggested suitable solutions to the problems faced by farmers. Dr Rajbir Singh, Director, Agricultural Technology Application Research Institute (ATARI) and Mr J M Bala Murgan, Secretary Agriculture, Government of India were present on the occasion.Sh. 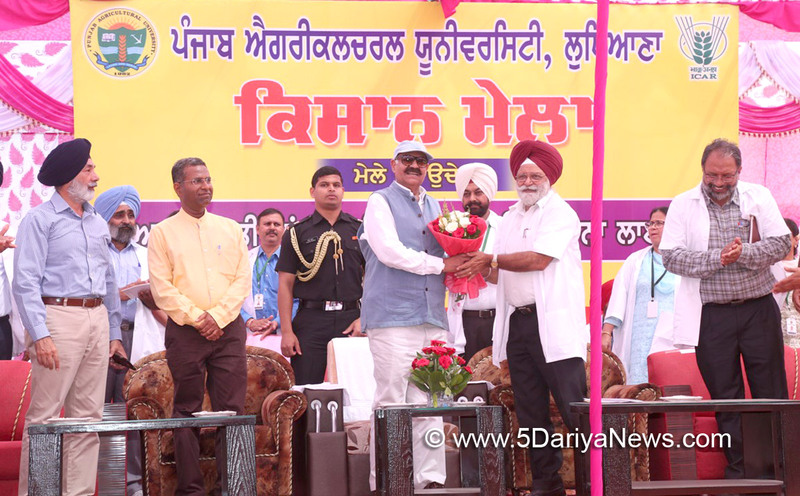 V P Badnore, Governor, Punjab and Chancellor of Punjab Agricultural University (PAU) highlighted the efforts of the farmers of Punjab saying that the farmers of our country look upto them for progressing in their respective field. He urged the farmers in his inaugural session to attend kisan melas organized by PAU from time to time and to make use of latest farm equipment and techniques for having better crop yield. He emphasized that the farmers should stop stubble burning for saving the environment and form Farmers’ Producers’ organizations (FPO) for better marketing of their produce.While welcoming the chief-guest, Sh V P Badnore, Dr B S Dhillon, Vice Chancellor, PAU stressed upon the need for using fertilizers sparingly, getting soil tested, using inputs as per requirement, maintaining farm records and adopting subsidiary occupations. He impressed upon the farmers to shun stubble burning and adopting methods such as Super Straw Management System, Happy Seeder etc to control this menace which causes several health hazards. He further advised the farmers to make judicious use of farm literature especially digital weekly newspaper Kheti Sandesh which is now available on Whatsapp. He also informed the farmers about the latest varieties of Wheat and rice emphasizing at the same time the need to raise kitchen gardens which can go a long way I improving the family health and the economic condition of the farmers.Kamaldeep Singh Sangha, Deputy Commissioner, Amritsar was also present at the occasion. He expressed satisfaction with the massive strength of farmers at the mela. He appealed the farmers to go by the advise of the university experts and opt for hybrid seeds in order to have improved crop production. Numerous stalls were set up on the mela grounds for providing the farmers useful farm machinery, magazines, seeds, tools etc. He exhorted the farmers to have regular interaction with the university scientists in order to remain updated with the recent advances in farm practices.Dr. Navtej Singh Bains, Director of Research, PAU proposed the vote of thanks and shed light on the contribution of university scientists in the progress made by farmers in the field of agriculture..
Punjab Governor releases Shiv Khera’s latest book titled "You Can Achieve More"